A Thought Experiment into the nature and implications of new media art. I’m sitting here which will become there. I’m sitting here now which will become there, then. Through the actual utterance of these concepts around where and when I am doing what I am doing, I aim to evoke a sense of mental disconnectedness from linear ideas of space, place, time and perhaps narrative by calling a mental subroutine of imagination. This imaginative sub-routine call or process, this re-imagining and re-construction of time, space and linearity, as, initially, a purely mental process will hopefully allow me to investigate new media art as a means of understanding ourselves and the world around us. The term New Media is problematic at best. “A generic term for the many different forms of electronic communication that are made possible through the use of computer technology. This definition helps to contextualise some of the issues involved in trying to find a starting point from which we can investigate new media: Firstly, this definition itself is a new media “product” or artifact in that is a (HTML) web page that itself links to other wepages and other social sites via hyperlinks. It is a subjective artifact of that which it tries to define. Secondly this HTML page is transient in nature – although this definition may well be the case today (which is not necessarily the case) it does not follow that this definition will hold true tomorrow. This subjective artifact of the medium it purports to define is time specific. Thus there is a peculiar (perhaps even peculiarly postmodern) aspect to the very definition of new media, whereby it can be said that new media does not necessarily know what it is and a definition will always be hard to nail down because of the word “new”. In this way, new media can be seen not only as transient, fluid and ever changing in terms of both its form and content, but also as being in a liminal state; a state of “becoming”, of evolving, of metamorphorsing from what it is “now” to what it “will be”. At this point I am going to halt my own linear narrative and take a little time to reflect on what I have just written in order that I can get some critical distance that is necessary for a “reflective experience” (Lee, 2009). What I will do however is place a mental hyperlink from this point to a point in the future where I can re-open this particular window of investigation. So, Jumping back to our fleeting and fluid definition of new media, it suggests that “electronic communication and computing technologies” are at the heart of new media. Bill Nichols in his essay “The Work of Culture in the Age of Cybernetic Systems” describes the computer as “..more than an object: it is also an icon and a metaphor that suggests new ways of thinking about ourselves and our environment, new ways of constructing images of what it means to be human and to live in a humanoid world.” (from “Theories of New Media”). The iconic computer from the Xerox PARC through the Amigas and Spectrums to the iPhone and iPad represent a scenario unique in cultural and social history. For the first time, the means of production (the tools), the routes of dissemination (the network) and the means of consumption are all mediated through the same technologies, based on the computer interface. From work to leisure we are now almost ubiquitous computer technology users and while these developments can promote the democratisation and participatory nature of personalised media and art production there are also ever present the corporate capitalist “traditional” re-mediated media that perhaps seek to control and redefine the new in order to develop “TV adverts only better”. However, before this story moves toward an exploration of what Bob Stein refers to as the “M word” (for both Marketing and Marxism) in new media, I feel it important for me to browse more laterally towards an examination of the computer as interface (the GUI). So I’m still sitting here/there (actually I’m somewhere and some-when different) and trying to articulate some of the plethora of thinking around new media art. As ever I find myself in front of a computer and more precisely in front of a screen. The display; the screen itself is what is often cited as critical area of investigation in new media that can perhaps offer the widest potential in terms of understanding ourselves and the world around us. The screen and the frame, the viewed and the viewer are all familiar areas of investigation in the history of art but the key difference between new media art and what has gone before is this sense of “immersion” and interactivity. Whereas in traditional media forms there is a sense of broadcast, a one way mediated “lecture” between producers and audience via the frame or screen, the new media screen offers a dialogue between the window object of perception/presentation and the viewer/user. This shift from viewer to user forms a central investigation point in new media criticism – the concept of a realisation and representation in real time of a window that can also mirror and reflect a users actions offers up new forms of experimentation and investigation. The key here is the digital nature of the new media forms. At the heart of any digital representation is digital data that due to its construction (made up of 0s and 1s at its most fundamental) can free form from content and can therefore be manipulated and re-represented: Thus in the digital world of the window mirror we can re-represent data feeds from weather stations as digital graphs, visualise audio data and even “listen” to digital images. As experimental art practice has taken advantage of the particular peculiarities of the development of digital datas ability to free form from content, the folding of both space and time through digital manipulation and re-mapping has led to interesting insights and a re-imagining of our perceptions of the world around us. This small sample of works that emphasise our relationship with time and space perhaps have their origins in moving image experimental work that introduced specific time and space based interventions in real time: For example, Peter Campus “Origins” (1972) and Peter Weibels 1973 work “Observation of the Observation: Uncertainty” and Dan Grahams “Present Continuous Past(s) (1974). The commonality between these works often involves the shifting perspective of the participant/viewer when engaging in the interactive feedback loop offered through the screen/frame that represents both window and mirror. 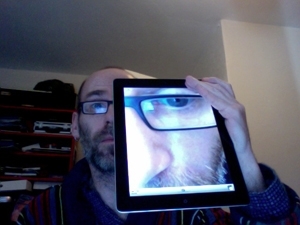 The user participant uses the screen/frame both as a window through which to look into a parallel space-time and as a mirror that reflects his own interaction and participation in the feedback loop. In this way the screen becomes the mediator of the experience as well as existing as a central object in the space of the work. This notion of feedback and interaction is critical in investigating how the re-visualisation of digital data can impact on the viewer/user. Interaction in art is not a new media phenomenon, there has always been dialogue between artist/producer and viewer that exists as a feedback loop whereby the viewer (of a traditional static artwork) can reflect his own interpretation onto the work. This act of interaction as interpretation has traditionally allowed a critical space for reflection on, and reading of, an artwork, but within the screen of new media, that room for reflection, a space and time to evaluate the experience is often lacking, as the screen/frame itself, as part of the experience, begins to dissolve and the critical distance between artwork and viewer diminishes. Therefore, in order to encourage that critical reflective space, the new media window/mirror finds itself in a shifting state of presence: sometimes window, sometimes mirror and sometimes traditional frame, in order that the viewer/user can interact, be immersed and reflect on the experience. Thus in new media the frame of the screen becomes mirror and window, and as the complexity in terms of spatio-temporal layers of interaction increase, so the frame becomes a frame within a frame; windows that look at mirrors and mirrors that reflect disparate times in that same windowed space. The window I am looking at now as I type this, contains a representation of the time I have spent doing this typing. Simultaneously, in the same space where I type this there are several other windows that offer me a view into other “times” and “places”. As these windows literally open up in terms of the GUI of the screen, we are faced with interacting with a mirror world that is a multi-temporal space. This spatio-centric world of my desktop thus offers me windows into (or onto) digital imagery and film (as I wait for my film to upload to Vimeo), the digital content of my computer, a program I am developing in Processing, my website etc. whilst in the same space I am engaged with and interacting with what is now and what will be as I continue to type. This multi-temporal spatio-centric world of the computer with which we all now seem to be familiar, is suggested by Manovich as being an underlying condition of the “digital cinema”, whereby we may come to expect an increasing emphasis on spatial elements of arrangement, of montage and of experience as opposed to the “show and replace” temporal approach of traditional moving image practice. This is but one example of thought around the implications for narrative in the new media frame. In Manovich’s digital cinema, temporal narrative is seen to be being replaced by a rediscovered spatial narrative akin to the art of Giotto and Courbet. A second concern around the nature of narrative in a new media concept loops and links back to my earlier exposition of the interactive new media loop in the ever-morphing window/mirror. Manovich insists that the re-discovery of the loop as a narrative driver for new media has its basis in the mechanical; as in the cranking, circular loop of early movie cameras and the Zootrope. So the loop has a rightful place in the digital cinema as a “re-found” means of communication and representation. However, the loop of the new media window/mirror can be seen to break with traditional “Aristotlean” narrative (which has a beginning, middle, end with its archetypes and prescriptive form). The conflict between Aristotles Poetics and new media can be seen to centre around “..his idea of ‘mimesis’ as a truthful reflection of ‘reality’…(which) cannot hold since today it would make more sense to talk of ‘multiple realities’ for different readers(users). The nature of this narrative break may lie in the digital nature of contemporary new media. Aristotles poetics relies on a production line system where one process follows another in a linear fashion. In the digital world this can be compared to early DOS programming where commands were executed one after the other sequentially so as to produce a linear system. With the advent of Object Orientated Programming (OOP) (notably with the development of Apples Operating System) systems became co-existant and able to communicate with each other at any time depending on the route of the data flow. For example, the word processor I am using now has the text objects themselves as I type, but simultaneously there exist a number of tools that can affect the form of this content if I choose to activate them (for example change the font, colour, size etc.). Once again we witness windows in windows, form and content separated and a multitudinous narrative spreading out before us that is dependent on interaction via a GUI, and both dependent on and as a result of the digital nature of the truly multi-media machine (as in literally meaning many ways or forms of communicating). So this narrative break, whether heading towards a more spatially based narrative and/or away from Aristotles Poetics poses an issue in new media art. Within the digital context as investigated here, narrative seems to be in a constant process of creation through interaction that leaves the idea of an “ending” somewhat redundant. So, because of the very nature of the user/viewer interaction and the doubling multi-path options provided by that interaction in the non-linear window/mirror interface, there is a sense of new media art being un-finished, in flux or becoming. This notion of “un-finishedness” fits well with the fleeting temporal nature of new media although it can create a sense of “failure” and even death. The term “unfinished” is tainted with failure as well as the romanticism of imagination it imbues within us. For example the notion of how Benjamin would have formulated and presented a final version of his “Arcades Project”. How would Schubert’s unfinished symphony have turned out? And what impact on the world for the continued work of Keith Haring and Paul Monete? Thus the unfinished inspires imagination but also conjures up concepts of failure and the incomplete. But perhaps, as Paul Lunenfeld expresses in his essay “Unfinished Business”, it is the process of becoming rather than the end, that is in need of celebration. A constant flux, movement and dialogue between what is and what may be, can perhaps shine a light on that which “..is not a resolution, but rather a state of suspension” within which there are constantly emerging new opportunities and developments whereby we are encouraged to re-imagine, reflect and re-invent ideas of our own perceptions. New media with its constant re-invention of itself through its own mediation perhaps has an affinity with the unfinished – to quote Ted Nelson “Everything changes every six weeks now”. Through new platforms, new programs, new approaches and new tools that are developing, that obsolesce and that are replaced, perhaps exemplify the position of new media to be at the forefront of investigation into this philosophy of the unfinished narrative of the self. Lunefeld goes on to explore how new media activities and engagement can be compared to the flaneur and the mid 20th century avant-garde movement the Situationist International (SI). The flaneur with his altered, aloof and observational vantage point and the SIs notion of the “derive” encourage a re-examination of the urban cityscape in order to “engage with the city as an open-ended place of play and investigation”. This notion of the meander through the post-modern isolation of the city-scape can be paralleled with the new media experience in terms of both experience and language: we often “browse” the internet and create complex cyber-psycho-geographies of the online world. We follow where mood and links (hyper and physical, HTML, feet and trains) take us in order to discover something new, or reflect on something known or to gain a new perspective. This flaneuring typifies my meandering through this particular presentation of new media. My derive seems to drive or link me to a playful idea of the analogy between my imagination as a system for the re-mapping of space, place and time and the world I gaze into, the windows I use and the mirrors in which I see my thoughts reflected. If therefore, new media possesses aspects of the “un-finished” and elements of the “derive”, this helps me to hyperlink back to the anchor icon I left earlier when discussing liminality. As indicated through the constant re-invention and the very aspect of the “new-ness” of new media any art/media produced within this all consuming re-mediating space possesses an element of “becoming” and thus an aspect of being liminal; between states, neither this nor that, somehow intermediate. The consequences of this line of thought lead to number of different scenarios that can offer unique insights and discourse with regard to an examination of ourselves and our environment. The cybernetic world of the “Post Human” exemplified through the work of Orlan and Stelarc, offers new ways and platforms to discuss issues around gender, feminism and politics as our physically augmented selves (through cosmetic surgery, pacemakers, dialysis to name but three current cybernetic enhancements) “becomes other than (themselves) which is mediated through the new technology which determines it” (Clarke in Cybernetic expts). However, with this liminality comes an opposing view of the liminal as “monstrous, diseased, queer, black, female, insane” and “polluted” (Clarke). As much of the literature draws on concepts behind moving image works such as Terminator (1984), Robocop (1987), Johnny Mnemonic (1995), Blade Runner (1982) and the mulititude of “Frankenstein” adaptations, the cybernetic investigation calls us to question our nature in terms of how we react to “the other”, how we can come to terms with the “unheimlich” of the cybernetically “altered” and what this represents in terms of our understanding of our own natures. If we apply these concerns to the new media, the sense of the “unfinished” and the “derive” of non-linear narrative brings into question the supposed “rationality” of the machine. We are often halted in our everyday pursuit of operational procedure by claims of “illegal operations” and “fatal exceptions” as the temporal logic of the digital production line command clashes with the “illogic”; the “irrational”. This error; the polluted, the illogical, the irrational, the corrupt, the bug, the glitch, can often stop a process dead – “finished”. But the glitch itself, the ghost in the machine, the “irrational” is what may help us glean a deeper understanding of ourselves as irrational systems; it can force a new perspective. Thus, the glitch, the error, the corrupt, may inform a digital derive that we had not thought of before and hyperlink us into a new loop that helps lay out a new, new media narrative that is closer to our irrational selves and may help us to understand, interact with and perceive the world around us in new ways.